The quickest and easiest way to start using Merlin is download the pre-compiled binary files found in the Releases section. The files are compressed into 7z archives and are password protected to prevent Anti-Virus inspection when downloading. The password is merlin. In order to run Merlin from source, or to compile Merlin yourself, the Go programing language must be installed on the system. However, if you just want to run a pre-compiled version, you do not need to install Go. 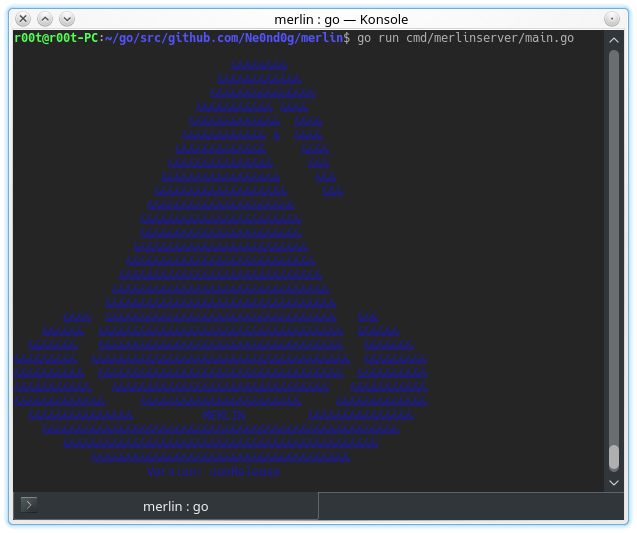 Merlin Server can be run as a script or compiled and run as a standalone binary file. Merlin is equipped with a tab completion system that can be used to see what commands are available at any given time. Hit double tab to get a list of all available commands. These are the commands to control an agent from the server. Tab completion can be used to select an Agent's identifier. By default, Merlin will load server.crt and server.key from the data/x509/ directory. You must generate your own certificate pair and place them in this directory. The 3rd party libraries used with Merlin are kept in the vendor directory. This project will default to using the library files in that folder. The agent portion of Merlin should be run as a compiled binary file on a target host. Ensure your GOPATH environment variable is set!